The festival included a short film competition where the top 10 videos produced by IICS students were judged by Astro On Air Promo Creative Director Abid Hussain, Malaysian director Aziz M. Osman and popular Malaysian actor Shahz Jaszle. “The general consensus among the Diploma in Mass Communication students and lecturers of IICS was that the short film industry in Malaysia is not getting the recognition it deserves. Filminutes, a short film festival, is an effort to spark greater interest in the industry among students of IICS and give rise to more talent and creativity in the field,” said Sharon Ding, Public Relations Committee Head for the event. 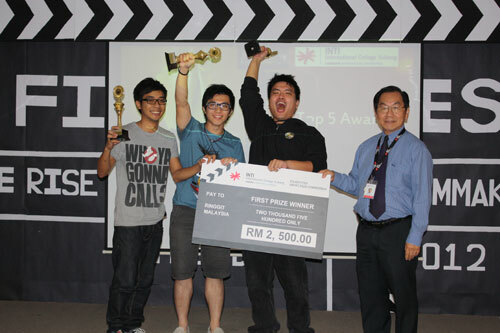 (from left) Jonathan Arcigal Chan, Chee Wei Hoong and Lee Hau Neng as they receive the first prize from INTI International College Subang’s Vice President of Academics, Dr Philip Tan Keng Song for their short film ‘Love Again’. Facebook, Twitter and Instagram accounts were created for the event which generated an enthusiastic response from the public who voted for the ‘People’s Choice Award’ video. Kevin Tan Boon Leong who directed the short film “Man-ny Lou” received the most number of votes and was honored with the ‘People’s Choice Award’. The short film competition winner was Lee Hau Neng who wrote and directed his short film “Love Again”, a story of a girl who loses her memory after an accident and finds herself in love with a guy from her imagination. Charlie Tan and Florence Khay, directors of the short film “Beyond Love” took the first runner prize while Amanda Lew nabbed the second runner up prize with her short film “Loving Kindness”. All winners received a trophy and a certificate each on top of cash prizes of RM2,500, RM1,500 and RM1,000 for the winner, first runner up and second runner up respectively. “Our programme’s approach to media studies addresses the artistic, creative and practical challenges posed by the mass communication industry. Students have the opportunity to showcase their creativity and ability to conceptualise, plan and execute an entire advertising campaign, as well as handle the event management and publicity aspect of it through team projects. With a Diploma in Mass Communication qualification, they are expected to possess all the crucial qualities necessary to react swiftly and critically to issues pertaining to the media industry,” said Dr Dominic Szambowski, Acting President of IICS. INTI is part of Laureate International Universities, the world’s largest private education network with a presence in 29 countries, with more than 60 accredited universities and 130 campuses, serving more than 700,000 students globally.